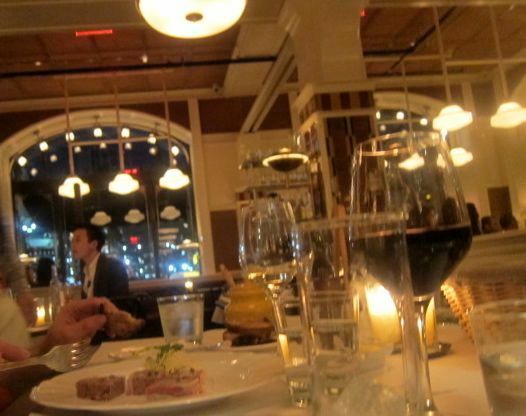 Couples at the window tables somehow manage to focus attention on dinner and each other. 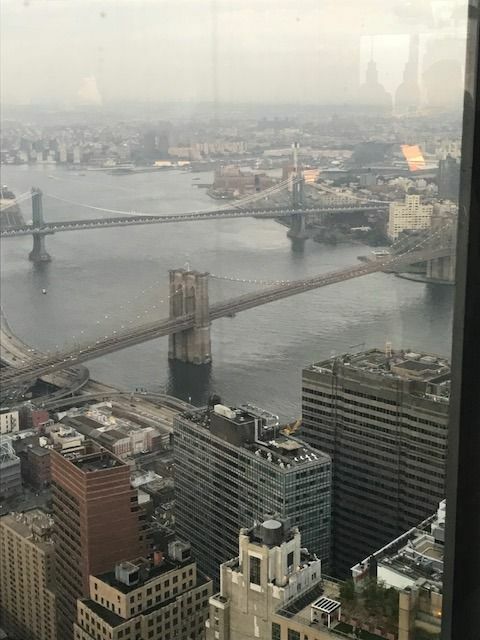 The view from Manhatta on the 60th floor of 28 Liberty Street, is a gift and a challenge. But Danny Meyer has determined to confront the task by fielding a determinedly casual service crew trained with the windows covered. 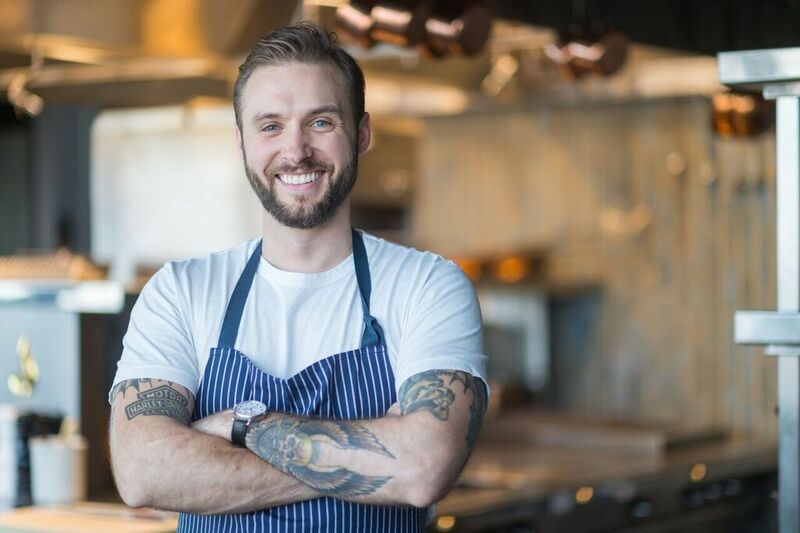 Executive chef Jason Pfeifer -- a veteran of Gramercy Tavern, Maialino, Per Se and Noma in Denmark -- aims for fine dining that feels "approachable and fun." Chef Jason Pfeifer -- a veteran of Gramercy Tavern, Maialino, Per See and Noma -- leads the kitchen crew. 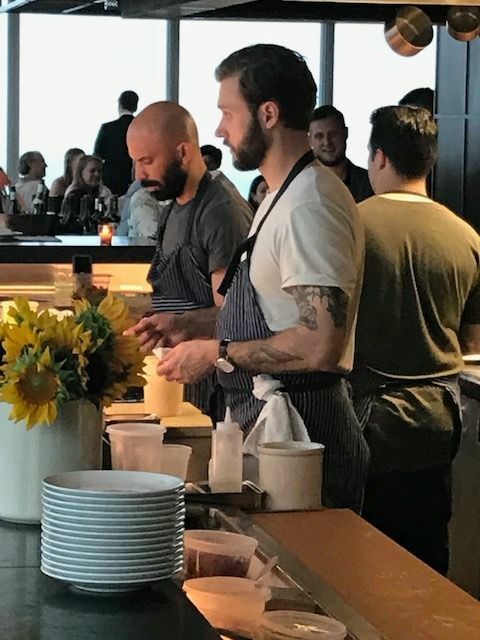 That’s why you’ll find binoculars on the window sill, the chef with tattooed arms bared calling the plays in the open kitchen, and servers in khakis and T-shirts under their aprons. Sorry. I can’t pretend looks don’t matter. I’d rather see greeters in more formal and flattering dress. Slices of Elysian Fields lamb are served with cranberry beans, cucumber and eggplant. There are just six choices for each of three courses on the $78 prix fixe menu. Elysian Fields lamb for carnivores. Zucchini and squash roulade with okra and eggplant for vegetarians. Scotch snails with sausage for the adventurous. 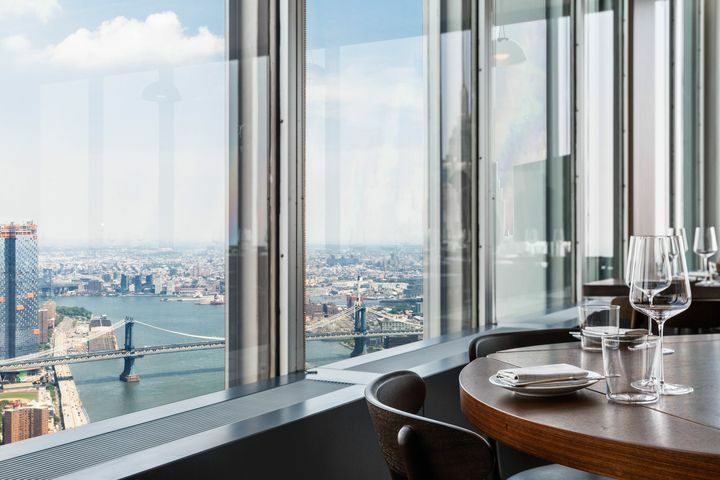 The restaurant is divided into different spaces, some with the better views of the sprawling city below. Just when you think your taxi is lost between Nassau and William streets, the well-marked, dedicated entrance stops you. There are flowers and easy chairs if you’re waiting for someone and a path to the elevator that soars smoothly to the 60th floor. Greeters lead you toward the 40-foot walnut-and-granite bar backed not by bottles but by the dramatic view. Here's what you might see from the window. Grab a pair of binoculars and focus. 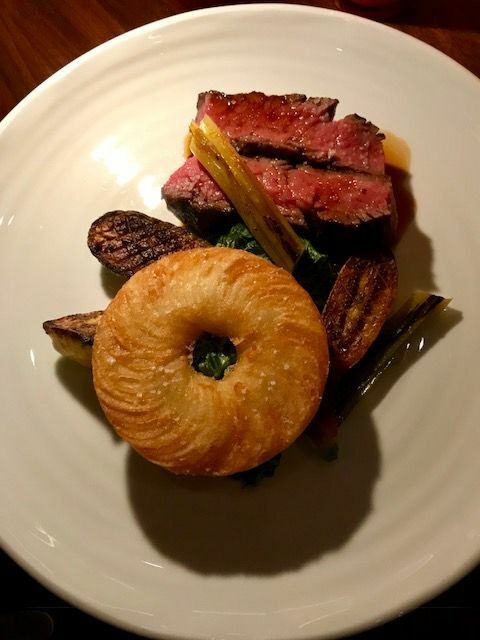 Conceived by Danny Meyer as “seasonal and soulful,” Manhatta is still brand new, so this is just a first impression. How neighborhood-y can it be on the 60th floor of what used to be Chase Plaza? I have a vision of David Rockefeller in his office with a tunnel to the Federal Reserve so they could deliver his allowance directly. Arrive early and you have a chance to watch the cityscape below evolve as the sun sets and the night goes dark. 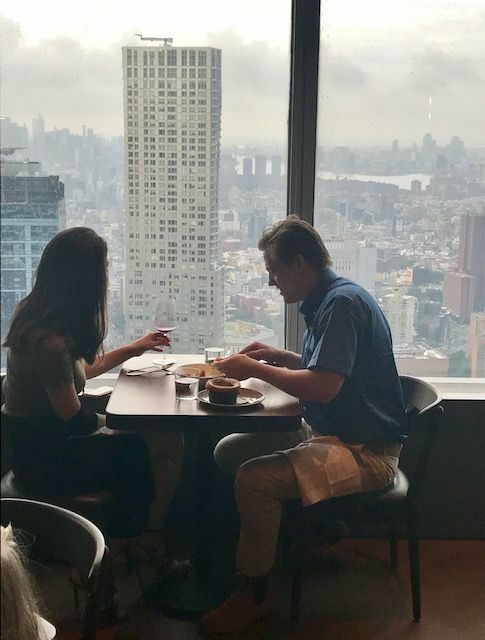 I find it impossible to ignore the staggering vision of New York City and her bridges from our spot several feet from the nearly floor-to-ceiling wraparound window, especially when the waiter disappears and cocktails seem to take a while. 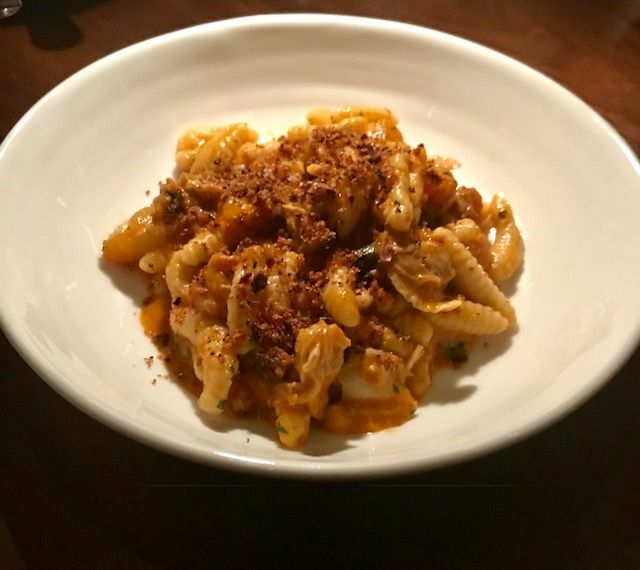 Cavatelli and clams with sausage, bread crumbs and tomato sauce is a first course option. The four of us have time to consider the statement of our bare table -- casual, economical, contemporary -- and to discover why that wall of glass doesn’t create unbearable noise. I reach under the big round tabletop and find a fat, hairy bundle of wool meant to soak up the din. We discuss who will order what for such a long time that we have to ask our server if we’ve ordered yet. “No, you haven’t,” we’re told. That’s the casual fun part. It could never happen at Le Bernardin. 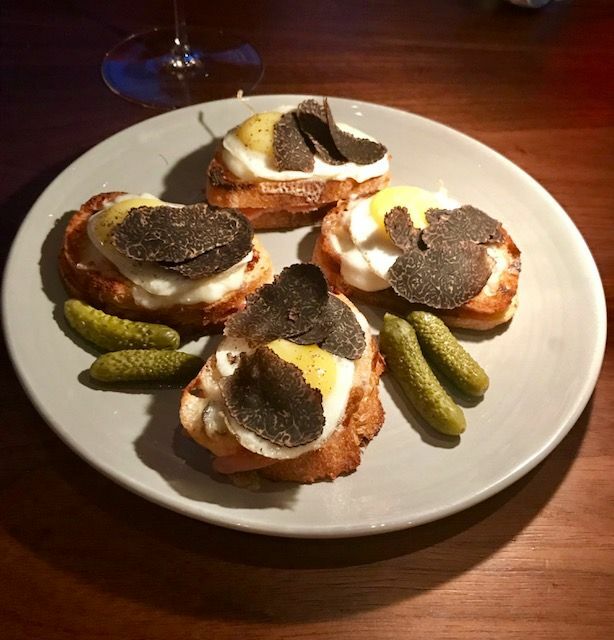 The house sends out small croque madame open face sandwiches from the bar menu. Dressed radishes on the stem and tarragon tomato pie are small snacks while waiting for dinner. 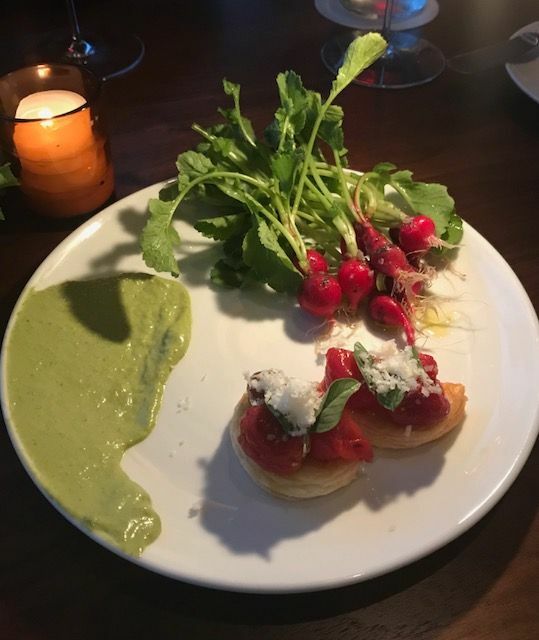 Perfect little radishes, in a lemony dress, still on their green stems, and tarragon green-tomato pie with herbed mayonnaise on one bite of puff pastry, bridge the longish wait for starters. The chef knows it’s me, so he sends four small croque madames from the bar menu too. Get to the point, you say. How’s the food? Surprisely good. I like Chef Pfeifer’s focused vision. The lightness of being a magnificent lobster quenelle afloat in a complex and airy lobster saucel, a must-taste. 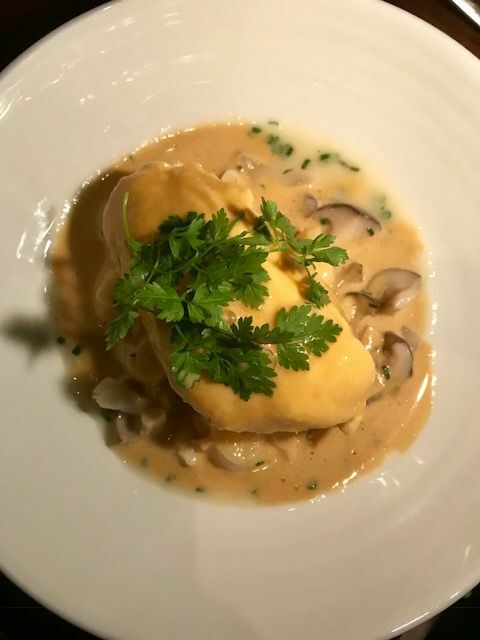 The lobster quenelle, miraculously delicate, floats in a fortified lobster sauce, creamy, buttery, my favorite of the starters. The cavatelli bound with clams and sausage in tomato sauce and sprinkled with breadcrumbs is a good choice, too. We’ve agreed to taste and pass. Beef tartare is unpleasantly soft and fatty tasting most likely made from Wagyu beef. 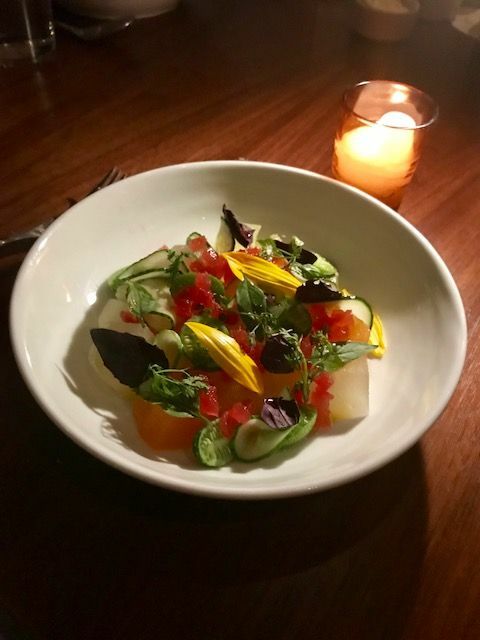 There is cucumber in the summer melon salad and a collection of herbs and flowers. The only salad offered -- melon with feta and cucumber -- is too sweet for me. 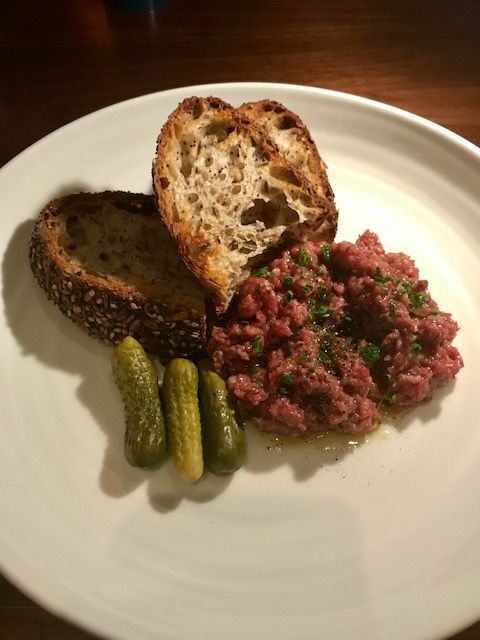 Beef tartare proves to be unpleasantly soft and fatty, perhaps because it’s made with Wagyu. The Wagyu bavette, comes with summer squash, a crisp disc of potatoes Anna and creamed spinach. 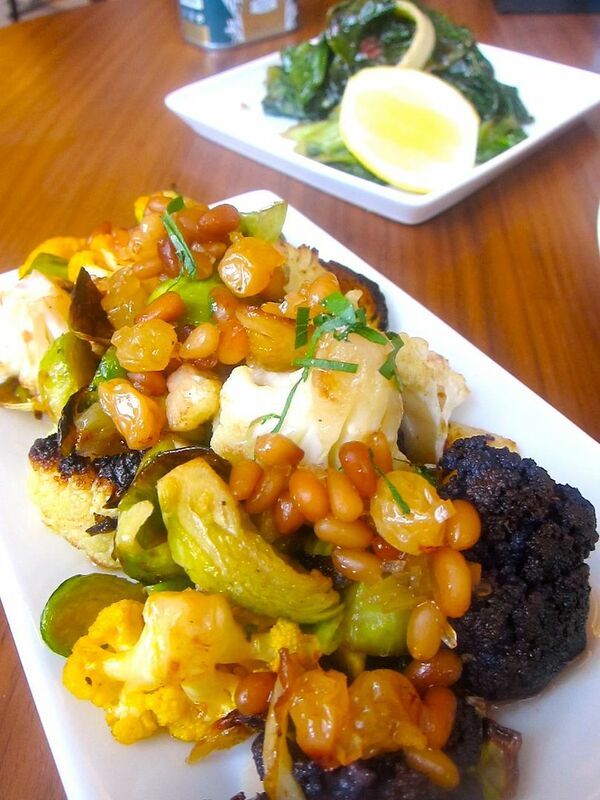 Every entrée comes with one or two vegetables. That’s definitely a plus. Radicchio, purslane, basil, and coriander flowers are tossed across slices of lamb, wonderfully rare and meaty, with cranberry beans. Creamed spinach, leeks and grilled zucchini nest beside slices of rare Wagyu beef -- so rich that a small cut seems enough. A crispy potato cake sits on top. I could finish that by myself. The blanquette of veal and sweetbreads sits in a creamy sauce with turnips, carrots and mushrooms. 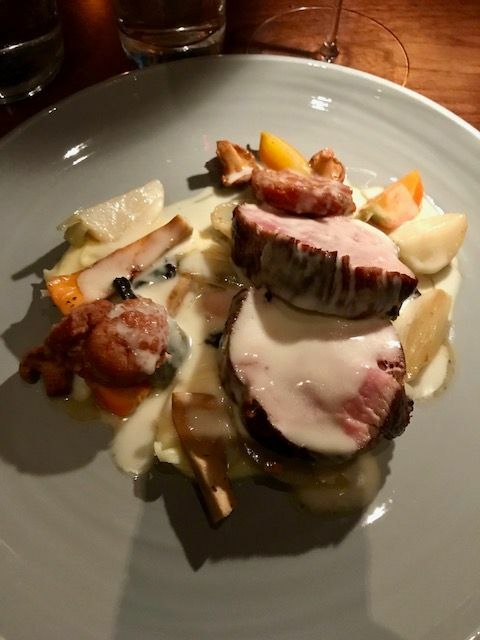 Turnips, carrots and mushrooms sit in the creamy sauce of the veal and sweetbread blanquette. 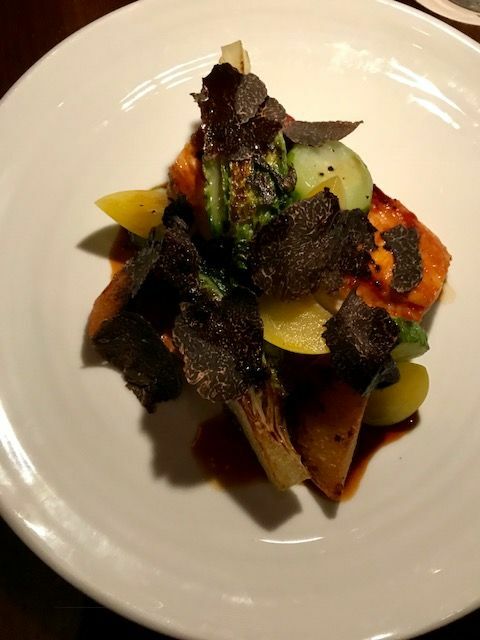 The chicken plate is piled high with stone fruit, lettuce and Australian black truffles. My fruity Fleurie by the glass goes well with everything. 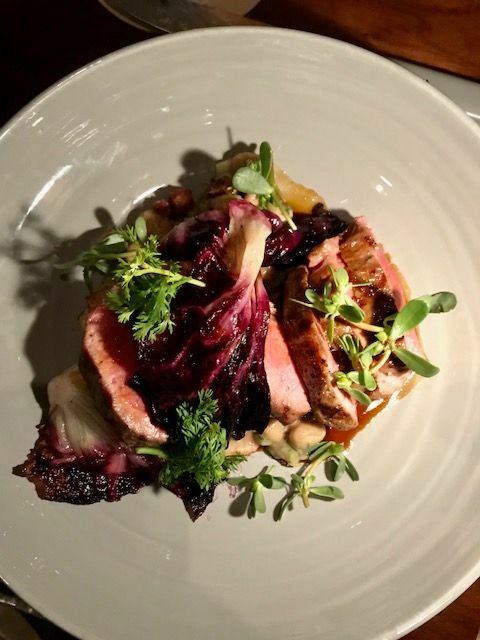 Four Story Hill farm chicken is a heaped high with stone fruit, lettuces, radicchio and Australian black truffle. Long waits between courses make me feel too full for dessert, but two bites of warm date cake with crème fraîche ice cream and whiskey sauce change my mind. I manage my share of blackberries with walnut ice cream and sabayon, and the chocolate mousse too. All three are more successful than the insipid vanilla soufflé. 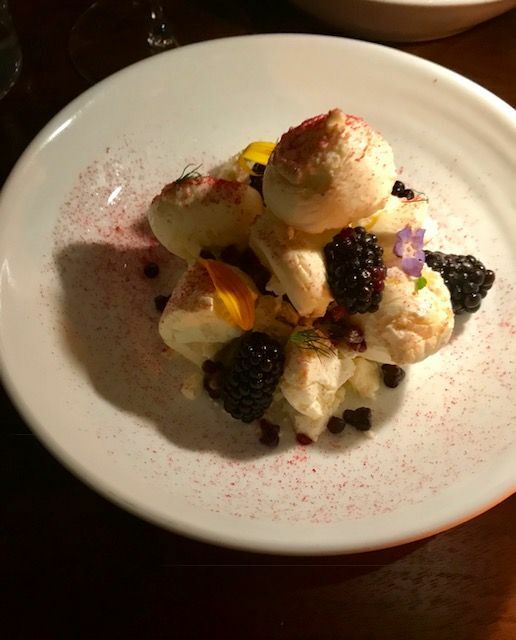 Walnut ice cream nuzzled with blackberries sits in sabayon sauce. Miniature canelés, caramelized pastries filled with rum and vanilla cream, arrive as a farewell with the check, $78 each, plus drinks, tip included. I make such a fuss over the goodies, that the manager hands me more in a small bag to take home. 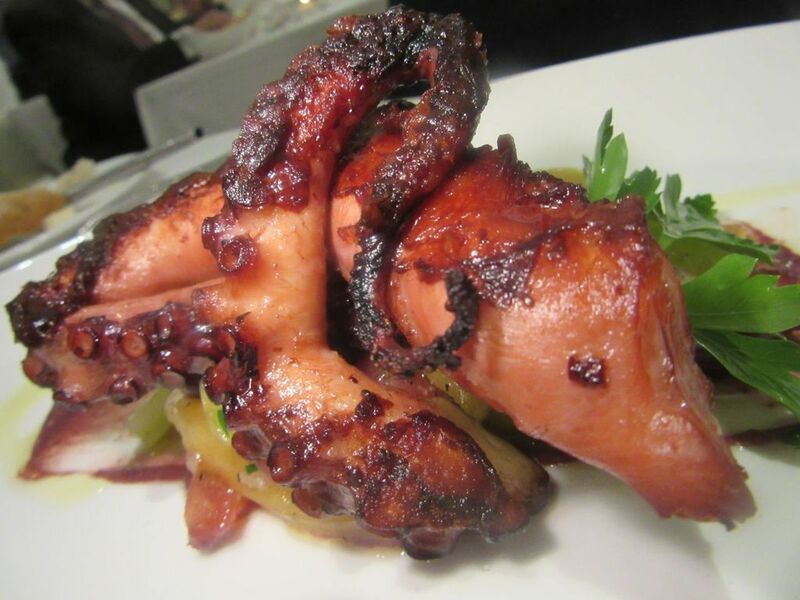 Chef Pfeifer enjoys designing a short menu of classics and new ideas to change with the seasons. I’m told the tables are just temporary and will be replaced, and that the debate over tablecloths is still going on. I’ll be back anyway, hoping to please out-of-town guests with food worthy of the stirring view and to satisfy my own love affair with the power and majesty of the city. 28 Liberty Street between Nassau and William streets. 212 230 5788. Sunday to Wednesday 5:30 to 9 pm. Thursday through Saturday 5 to 10 pm.